Not dangerous – just beautiful. 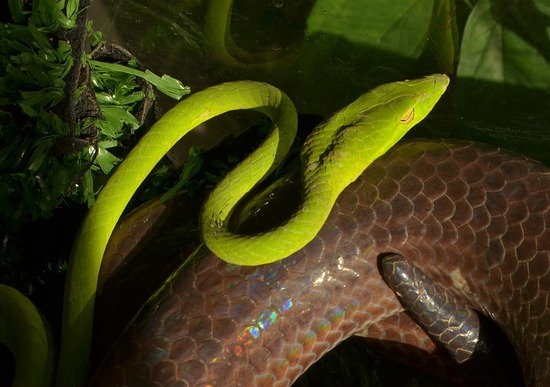 These are some really awesome looking snakes. Usually they come in brown (tan) and green (งูเขียว) color variations, but Rob Green, who has copyright to the images below – took these photos of a yellow one and a grey one. Quite cool. Rob was on Koh Kood (kut) near Koh Chang in the northeastern Gulf of Thailand when he found these snakes. The yellow images were taken with a Canon 7D. 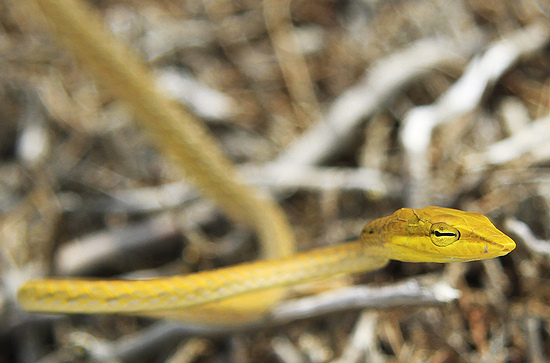 The grey whip snake – with his iphone. Thanks Rob! After you see these photos – you can see more at the Ahaetulla prasina Fact Sheet (click). There are photos and videos of me catching them in the Thailand forest. surley the sunbeam snake would chomp that vine snake right? Think I’ve just come across one at our hotel in Ko Phan Yang Is. , Sth Thailand (Great sight! bright green / about 2.5 m long & very thin). The hotel surroundings are very lush / jungly – the snake dropped out of an adjacent bush onto the path, stopped there for few seconds, then cut across the path, over a small wall & into the scrub opposite. I was very surprised to see it, but as I stopped too & allowed it to go on its way, it didn’t both me! Yeah, they’ll all just get out of the way if allowed to. Next Next post: Malayan Pit Viper Venom – Acts Fast!